From Quin: Following my immediately pre-hearing column laying out much of the case that the wonderful Susan Collins eventually cited when she announced she would vote to confirm Brett Kavanaugh to the Supreme Court, I was fortunate enough to receive two short bouts of national attention. First, I wrote this quick post explaining how and why Sen. Murkowski should “pair” (in effect, abstain) her vote on the Kavanaugh nomination, rather than vote “no.” I spread it on Twitter and to White House and Senate sources, who got it to Murkowski, who agreed, and did exactly as I suggested, thus accounting for the official 50-48 vote count (rather than 51-49 or 50-49). Second, I was asked to go on national Fox News, with Martha McCallum hosting, immediately following Kavanaugh’s public investiture. If you have Twitter, you can access the video here. If not, here is a mostly accurate transcript, although the two quick bits about a “lawyer working for his client” were not me, but Charles Hurt. 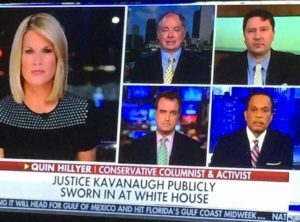 MACCALLUM: Quin, let me start with you because clearly putting conservatives on the Supreme Court is something that all conservatives wanted this president to do. So obviously you are behind that part of this, right? QUIN HILLYER, CONSERVATIVE COLUMNIST: I’m absolutely thrilled. I mean, I’ve known Brett Kavanaugh since 21 years ago this month and I was at his Rose Garden swearing-in in 2006 when he got on the previous court. I think the president made a great pick in Brett Kavanaugh and I’m very excited to have him on the court. MACCALLUM: but you’re not — it doesn’t change your opinion of the man himself, the president himself?